With ArtScilly approaching fast, we’ve been busy planning our art-orientated activities and offerings for 2013. It hardly needs saying that Scilly is an exceptional location for artists, offering a wide array of landscapes and seascapes together with beautiful beaches and flowers both exotic and unusual. Stephen considers himself extremely lucky to be living and painting here. scillytoday.com has already run an enthusiastic and positive article about ArtScilly 2013 which can be found here Preparations Underway for ArtScilly Week and we were pleased to see Steve’s Watercolour Sketching Morning mentioned as one of the ‘big hits’ of ArtScilly 2012. You can find our Photo Diary of the ‘Quick Watercolour Sketching from Life’ on our website here ArtScilly 2012 at Glandore Gallery We had a truly glorious day, some lovely students, lots of nice feedback and some delicious tea and cake after all that hard work. Also of interest to any prospective visitors for ArtScilly 2013, which runs from Saturday 11th to Saturday 18th May is the fact that the Isles of Scilly Steamship Company is offering discount fares for that week. 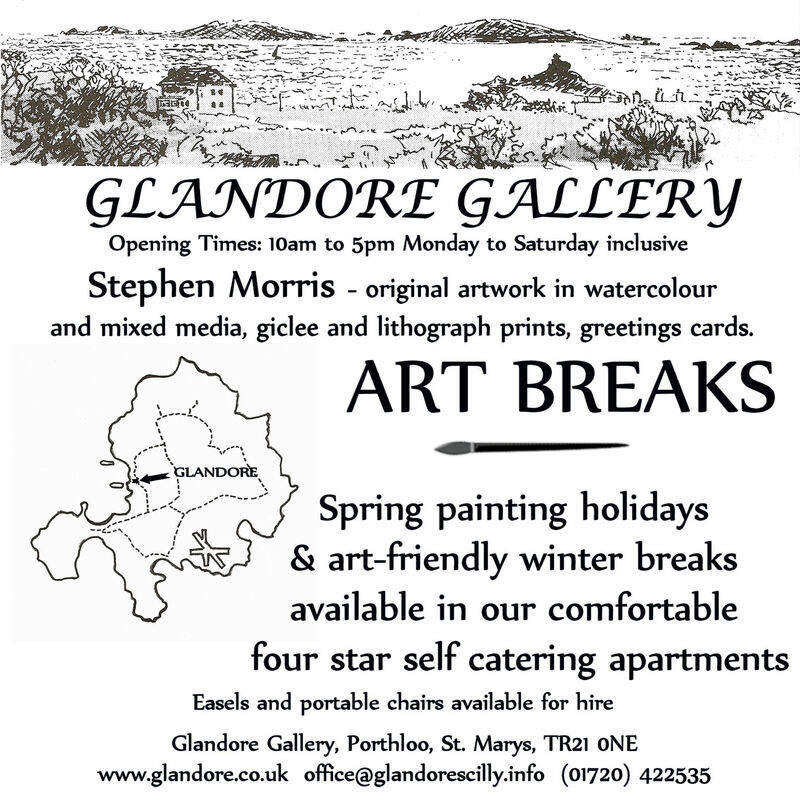 Below is our advert which will be in the black-and-white ArtScilly 2013 brochure. We are planning to offer extra services for artists visiting the islands and are hoping to provide folding chairs/stools and wooden folding easels for hire. We appreciate that the tight luggage allowance on Skybus means that artists might be limited in the amount of equipment they can bring with them to the islands. We are also planning to offer complimentary provision of equipment to artists who stay with us at Glandore Apartments. In addition, Stephen is considering offering tuition either to individuals, couples or groups but not in the main holiday season because that is the time when he can get out to paint himself. This summer we are refurbishing Aunt Nan’s studio/workshop at the bottom of Glandore’s garden and this will provide a comfortable, private, light-filled space for resident artists and tutorial sessions with Stephen. Regretfully, we have had to cancel our planned residential Painting Week for March 2013. With ‘Golden Eagle’ apartment unavailable due to major structural works (the creation of a new balcony with fabulous westerly sea views opening from double glazed French windows from the sitting room), we could only offer ‘Serica’ and ‘Slippen’ which were both booked. Then, in early January, one of the bookings was cancelled due to the visitors being unable to secure ‘dog sitters’ plus the uncertainty over travel arrangements to Scilly before Easter. The remaining booking (some of our regular Glandore guests) then agreed to defer their Painting Week to March/April 2014. Work is progressing well on the balcony construction, despite the raw south easterly gales that have battered the islands over the last couple of days. Fortunately the balcony is on the sheltered side of the property and wasn’t badly affected by the gales. The boards have now been laid and covered with fibreglass matting and resin to form a hard waterproof layer. Nevertheless, the daffodils are definitely in full bloom on the islands! 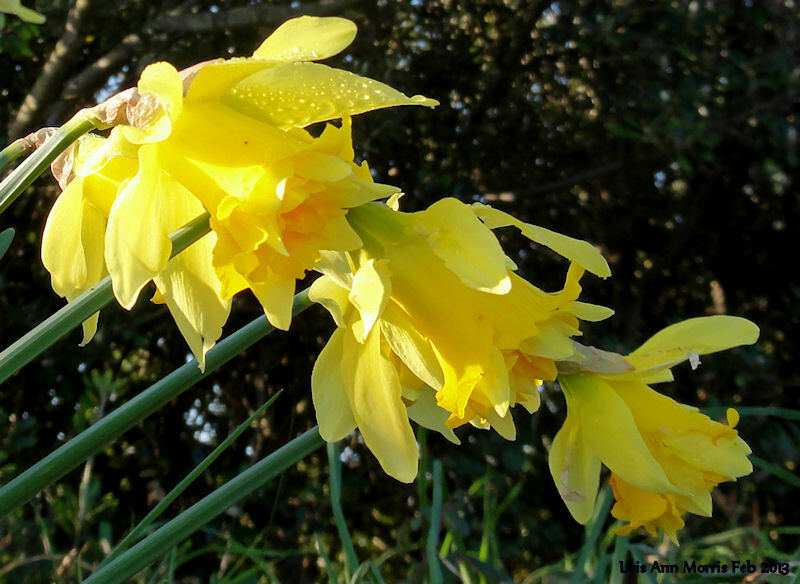 Daffodils are synonymous with spring on Scilly (and winter too!) so I couldn’t resist snapping this trio of frilly-skirted double daffodils that I spotted growing on top of a bank on my morning walk. The variety of daffodils growing wild in the banks and hedgerows on Scilly is truly amazing. I think many of them are old varieties and perhaps discarded in the past. I often play ‘Spot the Daffodil’ when I’m out walking.